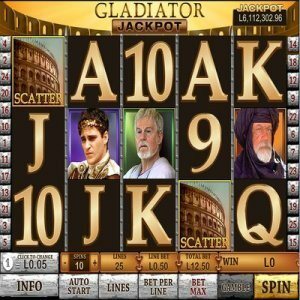 [miau] The Gladiator Jackpot Slot machine is a pretty intense experience for anyone who is interested in slot machines that take themselves seriously. As you play this machine, you get the feeling that you are actually accomplishing something as it plays a lot more like a video game than it does a slot machine. It is extremely easy to get lost in this game and find yourself determined to complete every challenge. The machine is based on the movie Gladiator starring Russell Crowe and the game includes many sound effects and images from the movie. You are Maximus as a gladiator and your job is to get through three levels of challenges before finally defeating the emperor. Once again, the game play here is pretty intense, but the developers managed to keep the game accessible for people who just want to enjoy the slot machine experience. There is a regal air about Gladiator Jackpot that is effectively set by the sound and graphics. The sound is extremely vivid and has several layers of activity going on at the same time. The game sound effects are dynamic and pretty loud, so you may want to keep your speakers turned down just a bit when you are playing this slot machine. The icons and all of the images for this game, including the arena background for the reels, come from the movie. The helmets are Maximus’ helmet cast in bronze, silver or gold. The opening movie for this game is also pretty fun to watch and gets you in the mood to play the game. There are a lot of ways to win in Gladiator as the game is filled with scatter symbols and bonus opportunities. You work your way into two separate coliseum bonus rounds where you could potentially win coins and an multiplier as high as 45 times. The game has five reels and 25 payout lines, which makes it one of the more generous slot machines out there. There are also quick multipliers and bonuses you can get as the game moves along. Gladiator Jackpot is more than a slot machine, it is an experience. From the very moment the game starts, you are immersed in a world of gladiators and emperors. The game keeps you engaged by constantly giving you ways to win and it is not nearly as difficult to work your way into a coliseum bonus as you may think. Once you get started playing Gladiator, you are going to find it very difficult to stop.